We've been growing Georgian Crystal for many years and we've enjoyed its consistent yields and size. 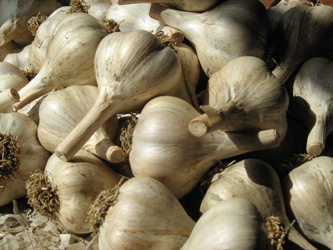 A porcelain hard-neck variety that is very hardy here in Central Maine, its satiny white bulb wrappers cover 3-7 fat cloves, with brown skins slightly tinged with red. It has a nice robust flavor that’s a little hot. Stores well until April. Originates in the Republic of Georgia between the Black Sea and the Aral Sea. Organic. Fall Ship.